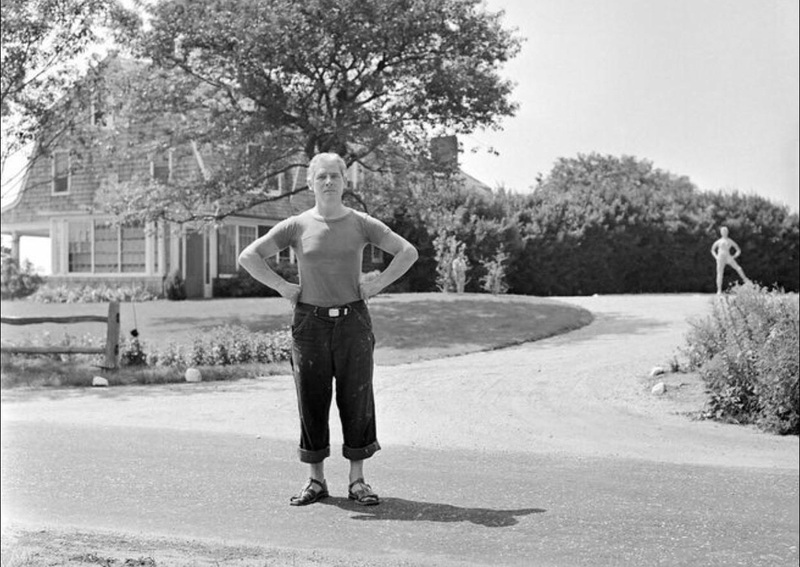 Willem de Kooning, standing in front of Leo Castelli's house, protecting a statue that Castelli himself had made in his driveway. Jackson Pollock disliked it and had threatened to run it over. East Hampton, 1953. By Tony Vaccaro. Legendary photographer Tony Vaccaro will speak at the Pollock-Krasner House and Study Center, Sunday, May 28, 2017, at 5:00 pm, for the official opening and reception for the exhibit "East End Art World, August 1953, Photographs by Tony Vaccaro." The exhibition of unpublished photographs has been up since May 4, and features twenty photographs selected by museum director Helen A. Harrison from eleven rolls of film found among Vaccaro's 450,000 negatives and transparencies. Maria Vaccaro, Tony's daughter-in-law, and Grace Ann Taylor, an NYU graduate student specializing in archiving, have both been working on the project for the Tony Vaccaro Studio, Long Island City, for nearly seven months. The Pollock-Krasner House is located at 830 Springs-Fireplace Road, East Hampton, NY, 11937. Monroe Gallery of Photography is honored to announce a major exhibition of more than 50 photographs by Tony Vaccaro at the Santa Fe Gallery this summer. The exhibit opens with a public reception for Tony Vaccaro on Friday, June 30 from 5 – 7 PM. The exhibit will continue through September 17, 2017. Santa Fe--Monroe Gallery of Photography, 112 Don Gaspar, is honored to announce an extensive exhibition of compelling photography of LIFE magazine photographer Grey Villet. The exhibition runs from May 5 through June 30. Born in South Africa, Grey Villet traveled America and the world for LIFE magazine like an observant explorer, mapping its emotional contours in the faces and lives of its people. His in-depth, personal studies of the American scene of the 1950s through the 1970’s illuminated the complex reality of those years with a truth that, in his own words, were "as real as real could get." His images of presidents and revolutionaries, sports heroes, and everyday people struggling for their rights tell an emotional and compelling story of an era that shaped the present. Grey Villet was born in a sheep herding center called Beaufort West in the Karoo desert of South Africa in 1927. His father expected him to follow him into medicine and Grey was duly enrolled in the pre-med program at Cape Town University. It didn't take; he spent most of his time at a cafe downtown where there was music and a lot of smoke...At about this time his sister's fiancé gave him a camera and that did take...It was the excitement of seeing his own pictures emerge in a friend's dark room that set the course of his life. By the late 1940's, his despairing father sent him to London to study photography---but after a few months Grey left school to earn a meager living doing wedding snaps while living in a trucker's stop hostel. At 20 he landed a job on the Bristol Evening News--and within 2 years had moved up to Reuters International in London on the strength of his newspaper work. At 24 he returned to South Africa and a job at the country's leading newspaper, the Johannesburg Star--but the pomposity of management's objection to his disheveled look after a night of chasing a rough news story decided his future. Already determined to become a "magazine photographer" he quit the Star on the spot and soon set off for New York hoping to land a chance at LIFE. So it was that Grey's Villet’s career with LIFE magazine began in April of 1954. Within a year of being added to LIFE’s legendary roster of photographers in 1955, he won photojournalism’s most prestigious award when he was named Magazine Photographer of the Year. Other honors followed, including multiple firsts from NPPA and Gold from World Press Photo. Villet excelled at LIFE’s acclaimed essay format, which exemplified his mastery of the medium, attesting to his credo that every story be, in his words, "as real as real could get". To achieve this, he generally used only available light and while shooting became as unobtrusive as a "fly on the wall" to allow meaningful moments to emerge naturally from a fluid reality. Featured in the exhibition are excerpts from Villet's intimate images of the interracial couple, Richard and Mildred Loving, who married and then spent the next nine years fighting for the right to live as a family in their hometown. Their civil rights case, Loving v. Virginia, went all the way to the Supreme Court, which in 1967 reaffirmed the very foundation of the right to marry. The 2016 film “Loving” Loving”, from acclaimed writer/director Jeff Nichols starred Joel Edgerton and Ruth Negga in the roles of Richard and Mildred Loving. In an era before any digital tinkering with results was possible, Grey Villet’s technique was one that required intense concentration, patience and understanding of his subjects joined with a technical mastery that allowed rapid use of differing cameras and lenses to capture and compose the "right stuff" on film as it happened. “RIGHTS, RACE & REVOLUTIONS:A Portrait of LIFE in 1960s America by Grey Villet” was exhibited at the Museum at Bethel Woods April 2 – December 31, 2016. THE LOVINGS: AN INTIMATE PORTRAIT, a new book that documents the extraordinary love story of Mildred and Richard Loving, was published in April by Princeton Architectural Press and is available in the gallery.